Sign up for one of our retreats here! Our commitment is to help build strong families and relationships – and retreats are one way we do that. These events offer concentrated time to sow into both the individual and family! Rescue, offers wisdom, encouragement, and practical applications. 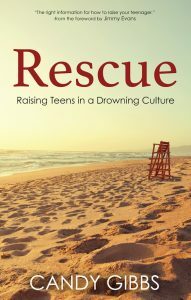 Working with a young group of “Lifeguards” throughout the book, Candy gives struggling parents the life preservers they need to rescue teens out of a drowning culture. With biblical insights and Candy’s own creative techniques, Rescue is the “Noah’s Ark” of parenting books, ensuring that today’s teens will carry on a legacy of godliness to generations to come. Click here to order! 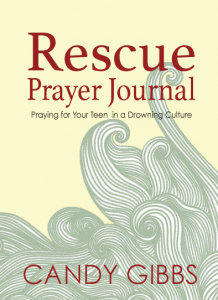 As a companion to Candy Gibbs’ Rescue: Raising Teens in a Drowning Culture, the 12-Week Rescue Prayer Journal offers compelling evidence of why you should pray for your teen, as well as, encouragement for how to pray for your teen. With bits of wisdom from Rescue and loads of scripture, this 12-week prayer journal is the life preserver you need to begin consistently praying for your teen in the murky waters of this drowning culture. Click here to order! The Rescue DVD Teaching Series is seven sessions of teaching filmed over one weekend. Candy speaks on every topic touched on in her book. She delivers her message in such a powerful and dynamic way–the words of Rescue come to life. Within the DVD series you will find seven sessions taught by Candy, Candy’s personal testimony, worship sessions with Molly Anderson, and much more bonus content featuring the Lifeguards. Click here to order! For more resources, including a RESCUE GROUP STUDY leader guide, click here. 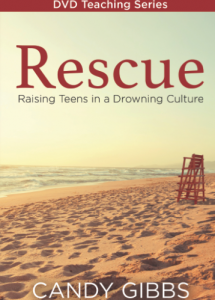 Do you and other parents want to get together to study Rescue: Raising Teens in a Drowning Culture? It is always helpful to gain perspective from other parents, talk about the current turbulent teen issues, and build a sense of community. With the Rescue Group Study, you can do just that! Below is a simple guide how to use Rescue for your next group study. 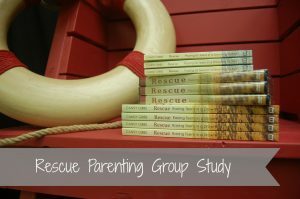 Because the Rescue book, the actual filming of the seminar, and heart of the Rescue Prayer Journal are separate projects, we have incorporated them into one study. The chapters and sessions do not always line up numerically, but Candy’s message is the same. We want you and your group to dive into one topic at a time and focus in on what God has to say about your teen and this current culture. Let’s get started! Visit the store page for more great products, like T-shirts and more!